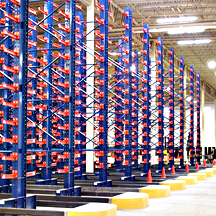 Cantilever rack systems offer storage solutions for long and heavy items that cannot be easily stored in other traditional styles of pallet rack systems. This type of rack system is constructed of a series of single columns accompanied with extended arms and sturdy bases that create open shelves, allowing for unobstructed front load storage of long, bulky or awkward shaped items. The arms are easily adjustable and available in varying lengths, allowing you to store goods with different proportions. Unlike traditional pallet racking, cantilever racks do not have the same horizontal restrictions, as there are no horizontal beams to get in the way of loading and unloading your goods. The entire length of the cantilever rack can be put to use and items of different weights, widths and lengths can be stored on the same level. The vertical and horizontal restrictions of traditional pallet rack systems can damage your products when organizing, loading or unloading. The open, flexible design of cantilever rack solves this issue. The rack design can change with your changing needs. Single-sided column rack can easily be converted into a double-sided column system as the columns are pre-punched on both sides.The arms can also be reconfigured, to accommodate the length and shape of your goods. Cantilever rack systems can be used for both indoor and outdoor applications. For outdoor applications such as in lumber yards, the rack can be structed of galvanized steel to help tolerate weather conditions. Height and angle of arms are easy to adjust to accommodate different sizes and types of products and materials. Accommodates long and bulky items that are hard to store on other types of pallet rack. Increased productivity as they reduce handling time, due to easy access to awkward sized items.